But recently, I'd been thinking about picking it up again, prompted by my fast-approaching analog spring in the North woods and inspired by other photographers like Jess and Maria who take beautiful film shots. So I loaded it up and fumbled my way through the F-stops (a challenge not only because I was rusty, but also due to that darned broken light meter), and shot an experimental roll, not sure if any would turn out. Many didn't, and despite tearing the film while rewinding, a few did and those were sufficient encouragement to keep shooting. 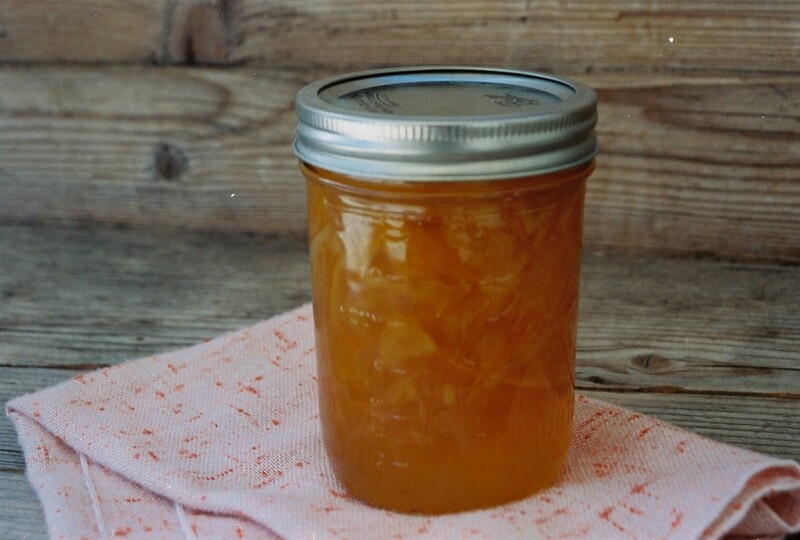 I was hankering to make this honey lemon marmalade that caught my eye when we were planning our winter canning party, and had been tempted by the Meyer lemons at the store. I figured that their yellow-orange hue would be a good subject for my film experiments, and snapped a few (along with digital--these you see here are a mix) while prepping the lemons. 1. Scrub lemons and remove buttons at the top of the fruit and cut in half around the circumference. Squeeze the juice into a large bowl and set aside. Using a large, sharp knife, slice the peel, pith and all, into very thin slices. Put the sliced peel in a bowl with the lemon juice and cover with 10 c. water. Let soak overnight and up to 24 hours. 2. Transfer the entire mixture to a large stock pot or preserving pan and bring to a boil. Once mixture is boiling, reduce heat and let simmer slowly, covered, until the peel is tender. This should take about 2 hours, and in that time the mixture should reduce by about one-third. 3. Stir in the sugar and honey. Bring marmalade to a boil, stirring until all of the sugar has dissolved. Boil rapidly until the setting point is reached (or until mixture reads 220 degrees F), at least 30 minutes. Remove pot from the heat and let cool for 8-10 minutes. Gently stir to disperse any scum. Pour marmalade into warm, sterilized jars and seal immediately. Use within 2 years. While my Meyer lemons were soaking, I came across this recipe for Alice Medrich's Seville Marmalade Almost-Linzer Torte from Emma of Poires au Chocolate and knew my nascent marmalade had already found its destiny (luckily I still have several jars leftover for more tarts or toasts). The Linzer Torte, similar to, thought likely pre-dating the Bakewell Tart, is thought to be one of the oldest cakes (I'd say it's more tart-like) in the world, dating back to 1653. Emma calls this an "almost-linzer," due to the lack of lattice work on the top and perhaps because of the marmalade substituting for a sweeter jam. Whatever you call it, I stuck pretty close to Emma's adapted recipe aside from lemons instead of oranges, with just a few adjustments-- more marmalade because I was making a tad larger torte and a slightly different crust technique because I was using a tart pan instead of a cake pan. It's a very easy recipe once you have the filling and the frangipane-like crust paired wonderfully with the just-tart Meyer lemons and honey combination. As Emma says, it would work with many different combinations of nuts and marmalades or tart jams--Steph from Desserts for Breakfast made a very wintery and amazing-sounding cranberry and clove version. 1. In the bowl of a food processor, combine almonds, flour, sugar, ginger, and sea salt until well combined. Add the cubed butter and milk, blending until the dough begins to come together. Wrap a 25g ball of dough in plastic wrap and place in the fridge. 2. Grease and flour a 6-8'' cake or tart pan with a removable bottom and transfer the dough into it. Use your fingers to press the dough into the bottom and sides of the pan until it is evenly dispersed and has a little lip on the sides. Place pan in the fridge for 30 minutes, and preheat the oven to 340 degrees F.
3. Spread the marmalade evenly on top of the crust and fold the lip of the crust over top. Take the extra ball of dough from the fridge, tear into small pieces, and scatter over the top of the torte. Place in the oven and bake for 30 minutes until the marmalade is bubbling and the crust pieces in the middle are deep golden brown. Let cool on a wire rack. 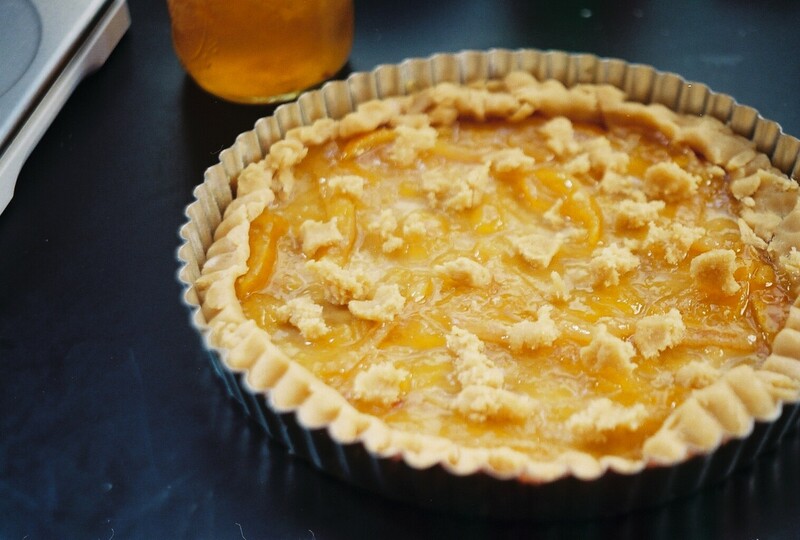 After 5 minutes, remove from the tart pan and let cool completely. Can keep up to 4 days in a sealed container. Labels: film, linzer torte, marmalade, marmalade tart, meyer lemon honey marmalade, meyer lemon honey marmalade linzer torte, Washington D.C. This looks gorgeous! I'll have to try the marmalade recipe. P.S. Alice calls hers a Linzer Blitz Torte - I renamed it Almost-Linzer as I changed the crust quite a lot from her recipe (which isn't traditional anyway) and took out several classic ingredients - egg yolk, zests and other spices. Thank you, Emma! And for the extra info too. I'll change the wording around a bit to reflect that. I need to get Alice's cookbook!